The site has been getting a few updates like the changes to the ebooks pages, the new ebook index coming soon, and the complete update to the theme to improve readability as more content goes up. Another change that is happening is the defunct author blog I started before the mess at the start of the year is being integrated with the main blog. One of the things I’ve been fixing this morning is tumblr integration, with the Killgrace tumblr so that hopefully posts here will have a bit more reach. Which is the main purpose of this post – testing! This is in the nature of a more personal post than I usually write, so I will cut to the chase. The Killgrace series has been on unexpected hiatus since January. During these passed months I’ve been in and out of hospital in a sequence of events odd enough to be one of my own stories. Now I have hopefully finally reached the end of it and can get back to writing. I’d like to apologise to everyone who was following the stories for the delay. I am picking these back up, and the new look to the site and new short snippets are the first step towards this. Hopefully getting the twenty-odd half complete stories written and in ebook format will occur at some time this year. The other thing I am now pressing for is getting the ebooks out of Amazon Select and into Kobo, Omnibooks and possibly Smashwords. I honestly hadn’t realised how popular the series was until I picked my email back up a few weeks ago, so thank you all for your support and I will be trying my best to get more stories out for you soon. 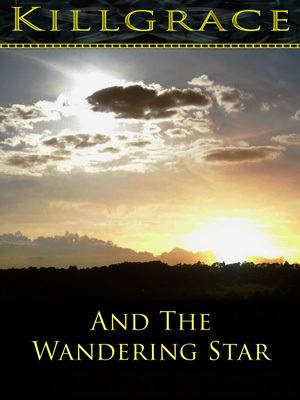 An early christmas present: the Cover for Killgrace and the Wandering Star. While a Wandering Star was the traditional astronomical name for a planet, in this story it is applied to a much more recently-discovered phenomena. Rogue stars are stars thrown out of position, often – it is theorised – due to the destruction of a binary companion due to a black hole. Hypervelocity stars travel at over 400 miles per second (600 kilometers per second). …And there is absolutely no way known to move a star with current technology. It may not be quite in time for christmas, but I have my author copy of Singular Situation in my hands, and it looks very good. US distribution has been arranged, but UK distribution is currently lagging, so this may be the only copy in Britain for a while. Killgrace and the Living Legend – anounced for a while, and details are available on the coming soon page. Killgrace and the Wandering Star – a planet under dire threat points everything it has to the skies to ask for help. Susan and Cet arrive at this decidedly stressful time – only to find they have a problem they have not encountered before. Killgrace and the Perfect Science (working title) – A series of unusual events on another planet leaves Susan trying to investigate. But when the rules of physics and even chemistry are different, distringuishing the criminal from the paranormal is difficult. Also look out for their (chronologically) second encounter with the Yvak, Killgrace In Desperation (1932 is a bad year), a clash between cultures on a distant planet, and a run in with an industry that even Cet takes exception to. To answer requests about a spin-off from the Renshaw and its crew, that is half-written, and will stand alone from the rest of the stories. As it’s completely new, once complete it may take a few months with an editor before I am happy to release it. One extra personal goal: I still have just under 2 million words from the original story cycle to re-edit, but I would really like to get the twinned stories “Boundary Zone” and “Last Battlefield” re-edited and released, since they mark the end of Era 0. And finally an seperate author blog for posts, details and general science chat not linked directly to the series is being set up, ready to cross post to tumblr, twitter, and others. In a world where the rules of reality are reversed, their past is going to shape the future. A old enemy, a new phenomena, and a chance to shape reality could be enough to split the team. This series is a mix of new stories and a set of novellas written around 2000 that were recently restored. As a result, tying these together has been difficult, for example, science marches on requiring updating the issue in Faithless. While these were originally meant to be pure pulp and a concept experiment on forces v. dimensions, the hard sci-fi appears to be attracting its own audience. As a result I am going to be focusing on rewriting the original arc stories: Rubicon, Good Neighbours, Living Legend, Cull Assassin, Ethics. and getting those out to create a framework for more of the shorter science fiction novellas. Also, you heard it here first: Singular did so well in its October run that there is every chance the Killgrace series will hit paperback. The Faithless sale will end shortly after 8am today, but the main results are already in. I was surprised that Faithless proved more popular than Singular, but also very pleased. It was most successful in the US, where it reached No.1 on the Hard Science Fiction and First Contact Science Fiction sub-categories, and the Top five on Science Fiction overall. The real news is that it also reached no. 1 on the Short Stories category, a category on the same level as Genre Fiction, Science Fiction’s parent, on Amazon. This really made a difference to the downloads. It may also have been the contrast, since much of the rest of the list at the time was romance or had pale coloured covers, and Faithless was sitting there at the top with a giant red sun and a flooded city. Faithless also picked up interest in the UK with Top Ten positions on the Hard Science Fiction and First Contact Science Fiction sub-categories, and was not doing badly in Canada and Germany, despite the language barrier. Faithless did manage one thing I have never seen before on Amazon: copies were downloaded in every Amazon region. Overall it was a very successful run, and it has given me a kick to get back to writing. To follow up, Inverted is back with the editor for a second review (it could be released now but the extra tweaks will make it a stronger story). Singular will be on 99cent sale until the 8th October – which should let you guess when Inverted is likely to be released. 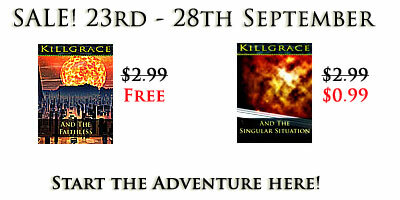 For this week, Faithless and Singular Situation are both on discount. Killgrace and the Faithless is available free on Amazon Worldwide. The webserial run is now complete. If you missed it, you can purchase the entire story from Amazon Worldwide. *Due to a rights issue with Amazon no more the 5% of the book will ever be available here at one time – so that is one day at a time. If you want to see the start, please view the Amazon Sample (Click here). Amazon Prime Members who want to skip ahead can borrow the entire book from Amazon free of charge. Killgrace and the Faithless, an Era 0 early mission is now available on Amazon. Why would a species abandon science and shun reason? Why is there such a schism in the culture they have just discovered? And why did Susan have to discover it by being arrested and sentenced to death? Sometimes a scientist’s life can be more interesting than it really needs to be. The free run is not over, and you can still get the book free on Amazon for today. Amazon US: #9 on the Top 10 free Sci-fi ebooks. Amazon DE: Top 2o in High Tech and Space Opera categories. Amazon Japan: #10 on the Top Ten Science Fiction titles. At the publishers, we are all still too stunned to be delighted. It has been far more popular than expected for hard sci-fi. If you have not got a copy, you can still get one free until the end of 10th August.